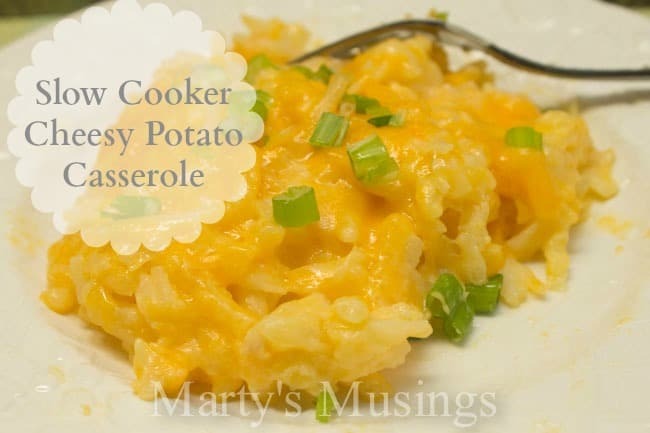 Need a side dish everyone will love but doesn’t take much time to make? 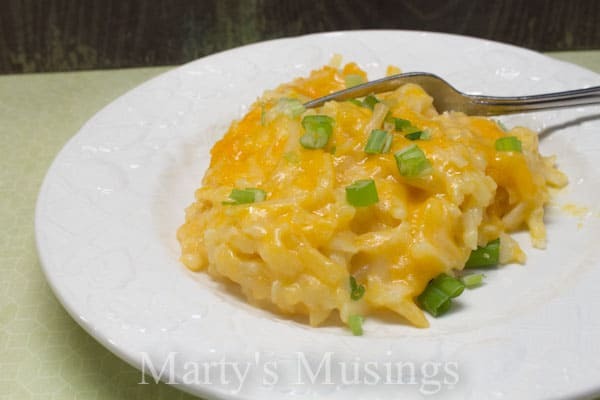 This easy slow cooker cheesy potato casserole is it! If you’re from the south y’all know about casseroles. They’re at every potluck dinner and many family meals. Dictionary.com says a casserole is a “noun 1. a baking dish of glass, pottery, etc., usually with a cover. 2. any food, usually a mixture, cooked in such a dish. 3. a small dish with a handle, usually used in chemical laboratories. verb 4. to bake or cook (food) in a casserole. Are you like me? Did you receive those lovely 9×13 dishes for your wedding? So today, my friends, we’re going to casserole (verb) a casserole (noun) in a casserole dish. Except we’re actually going to use the slow cooker because I think it’s easier. And the smell starts wafting through the house earlier. Simple recipe with 5 ingredients. Throw it in the slow cooker and you're done! Mix together Country Crock spread, cream of chicken soup, sour cream and cheese. Fold in hash browns and combine well. Pour into slow cooker and cook on low for 3 hours. This is such an easy recipe and works well in the slow cooker for a relatively short amount of cooking time. I sure do love my slow cooker, evidenced by these 7 easy Slow Cooker Soups and my Slow Cooker Lasagna. I’d love it if you’d browse my food recipes as your leisure. Visiting from Tasty Tuesday – this looks so good! I make a similar recipe, but have never tried it in the slow cooker. Good idea! This sounds really tasty! I’m going to get the ingredients to make it this week, but I’ll substitute cream of celery soup to make it vegetarian. That’s a great idea, Patrice. This is a simple recipe to substitute and change up the taste a bit. 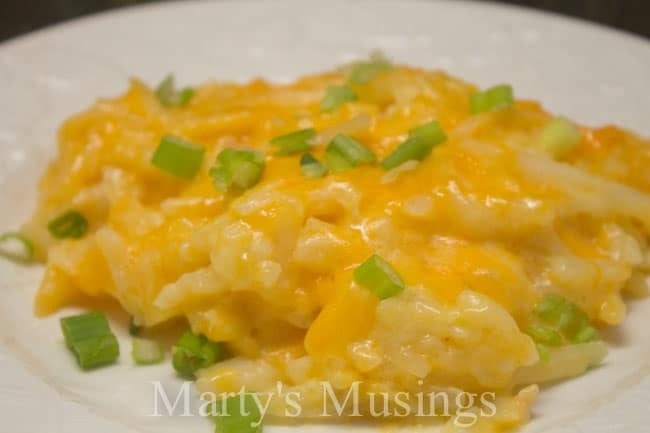 My grandmother made a Potatoe dish similar to yours, she identified the recipe by the name of “Georgia Taters”. Instead of shredded potatoes, we substitute quartered red potatoes or bite sized chunks of russet potatoes. We also did not use Cream of Chicken Mushroom Soup but substitute Campbell’s Golden Mushroom Soup. Lastly we added 3 to 4 bunches of chopped Green Onions tops, utilizing the bottoms or white portion of the green onions sparingly to taste. I can’t wait to try your shredded potatoe recipe, Substituting the soup and onions. Hi, Melissa. Your grandmother’s recipe sounds so yummy! Potatoes are such a great way to stretch a meal and a budget with teenagers! Have a great day! Hi, Shirley. We love serving this at Easter, and I love the slow cooker version because it’s so easy! I notice that at the top of the recipe it says 3 hours and the bottom says cook 4 hours. Which one is correct? Hi, Mary Ann. I’m so sorry to be so late getting back to you! I went back in and changed the recipe and then forgot to let you know! I only cook the potatoes for a total of 3 hours but sometimes it depends on your slow cooker. I hope you enjoyed the recipe!